NOTE: The events of this strip were fictionalized and did not actually happen. I have been eating fruits and vegetables, Mom! Thanks to Signing Savvy for their ASL references and resources. FUN FACT: I’ve never seen Game of Thrones! I haven’t even read the books. Metal Storm is the best video game ever you guys. I technically got back from vacation yesterday, but it was super-late in the evening. Thanks again to Brian Russell and Jim Cleaveland for their guest strips last week. I’ll have a new strip next Monday with an important announcement! Guest Week continues! Today’s guest strip is brought to you by Jim Cleaveland of The Inexplicable Adventures of Bob. 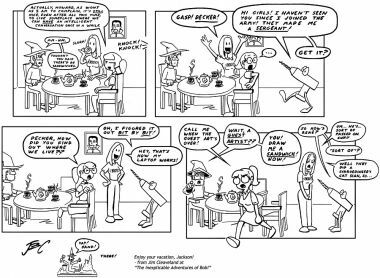 Jim demonstrates his familiarity not only with Sketch Comedy, but with my webcomics oeuvre as a whole! His onslaught of puns is nothing short of devastating, as is his deluge of classic Pungirls! references. I think my favorite part, though, is his fourth-wall-breaking interaction with Howard. Like Sketch Comedy, The Inexplicable Adventures of Bob is silly, smart, and fourth-wall-breaky, but it has a sci-fi theme and a greater emphasis on storyline. If you’re looking for a good place to jump in, I recommend starting with Molly’s Tale and There But for the Grace. Thanks again to Jim for providing a guest comic during my vacation! Welcome to Guest Week 2013! Brian Russell of The Underfold is no stranger to our guest weeks, nor to appearing in Sketch Comedy itself! 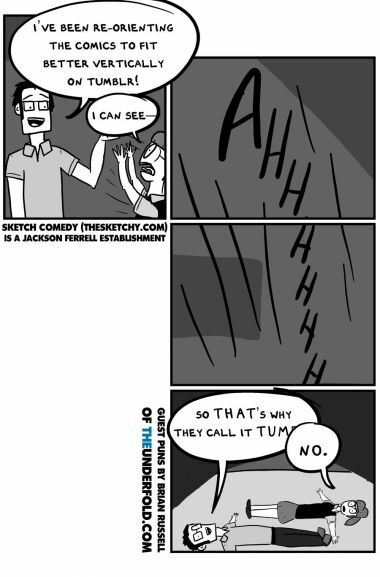 His guest strip refers to The Official Sketch Comedy Tumblr, where I have been reformatting and posting my strips in an effort to increase thesketchy.com’s traffic and readership. Marketing, baby! Brian’s past appearances in Sketch Comedy! Hi, everyone. From the 12th to the 19th, I’ll be taking my annual family vacation, and I’m looking for a few guest strips to run during that week. If you’d like to submit a guest strip, you can email it to jacksonpferrell *at* gmail *dot* com. 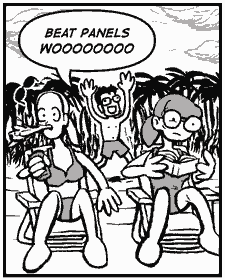 Please keep your strip 900 pixels or less in width; guest strips should be appropriate for ages 10 and up. Please send in your strips by Thursday, October 10th, to give me time to schedule the posts before leaving. Thanks much!